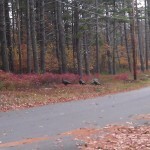 Here in Tuftonboro where we live, my daughter snapped a couple of pictures of wild turkeys running across the road. The Week Before Thanksgiving These Turkeys are on the Run! 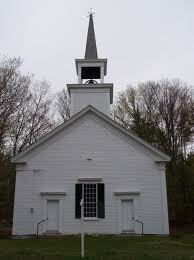 Wild turkeys disappeared from New Hampshire approximately 150 years ago due to hunting and habitat destruction. They were successfully reintroduced in 1975 and today the population is around 25,000 birds. The males are called toms and the females are hens. They are extremely social and tend to live in flocks. They arent territorial birds and often travel within a 4-5 mile radius during the year. The major predators are fox, coyote and fisher cats. It is not unusual to see these large birds along the side of Lakes Region roads picking up pieces of grit to use in the process of digesting seeds and berries in their gullet. There have been more than a few times that I have had to wait while these unusual looking birds take their time crossing a major road. I have never eaten a wild turkey, but I have heard that the meat is tougher than a domestically raised turkey. 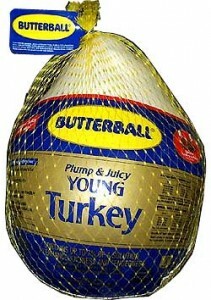 I guess Ill stick with a Butterball on Thanksgiving Day. I have witnessed wild turkeys roosting in my pine trees, and when spooked they make a racket taking flight, with twigs breaking and the beating of wings - it is truly an amazing sound and sight. 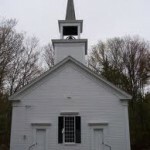 If you would like to learn more about the Lakes Region of New Hampshire, contact Steve and Carol Bush, Realtors, and let them share their love for this beautiful area of the world.